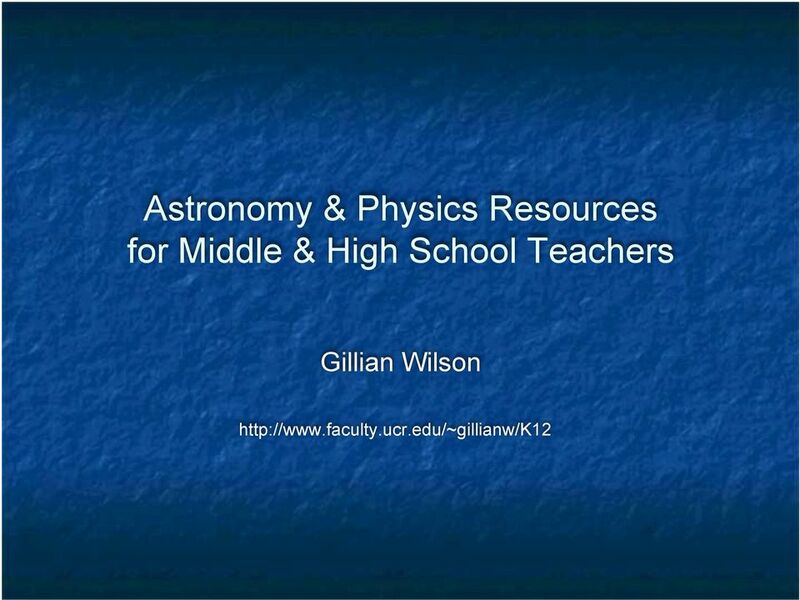 Download "Astronomy & Physics Resources for Middle & High School Teachers"
5 In State Standards Science Framework for California Public Schools, Astronomy falls under Earth Sciences Are there any Earth Sciences Teachers present? 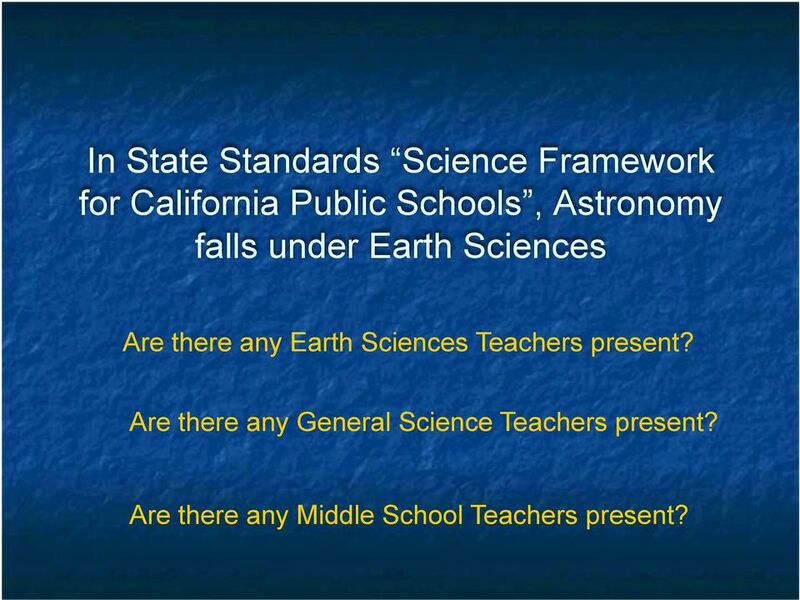 Are there any General Science Teachers present? 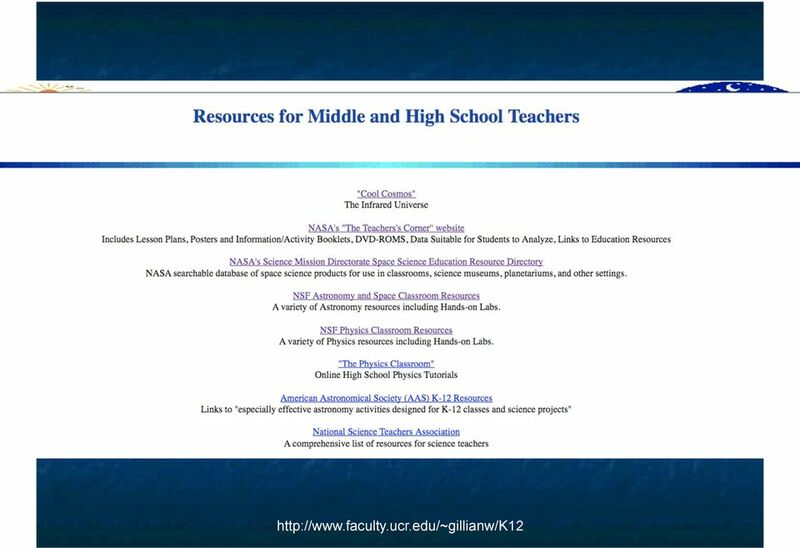 Are there any Middle School Teachers present? 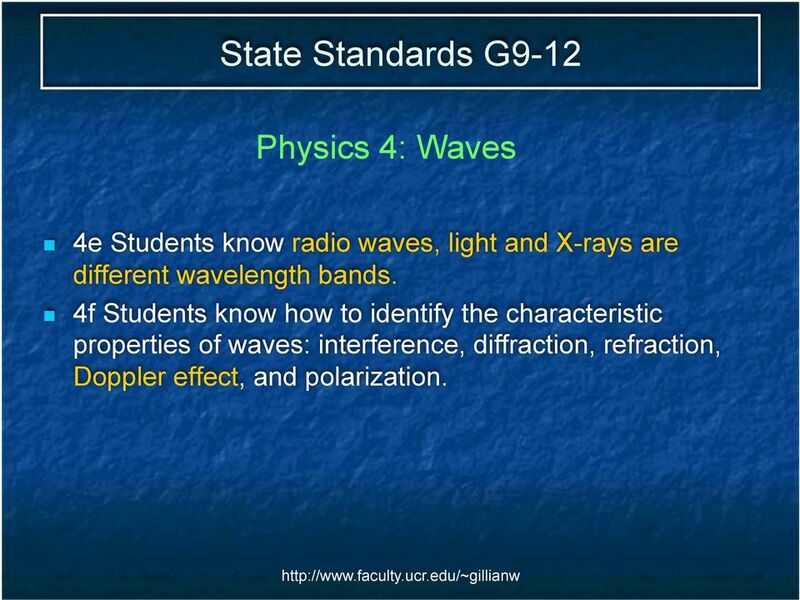 10 State Standards G9-12 Physics 4: Waves 4e Students know radio waves, light and X-rays are different wavelength bands. 4f Students know how to identify the characteristic properties of waves: interference, diffraction, refraction, Doppler effect, and polarization. 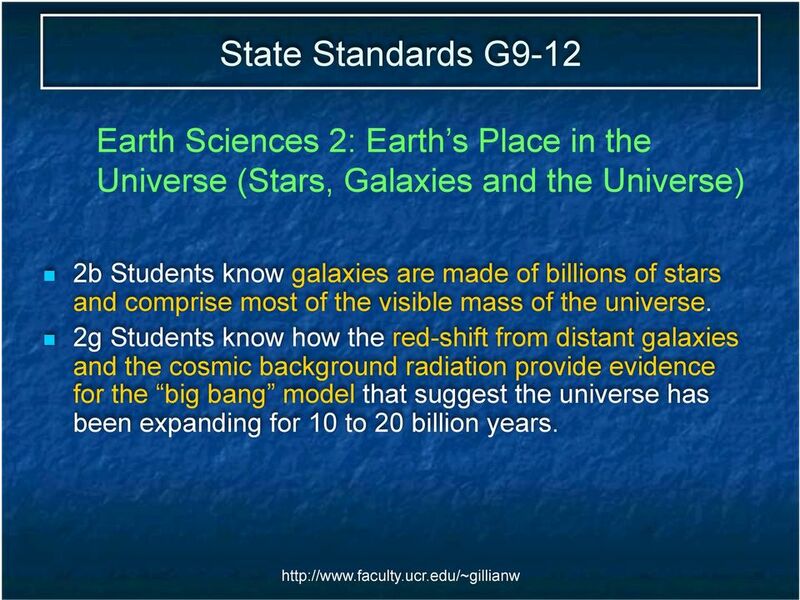 11 State Standards G9-12 Earth Sciences 2: Earth s Place in the Universe (Stars, Galaxies and the Universe) 2b Students know galaxies are made of billions of stars and comprise most of the visible mass of the universe. 2g Students know how the red-shift from distant galaxies and the cosmic background radiation provide evidence for the big bang model that suggest the universe has been expanding for 10 to 20 billion years. 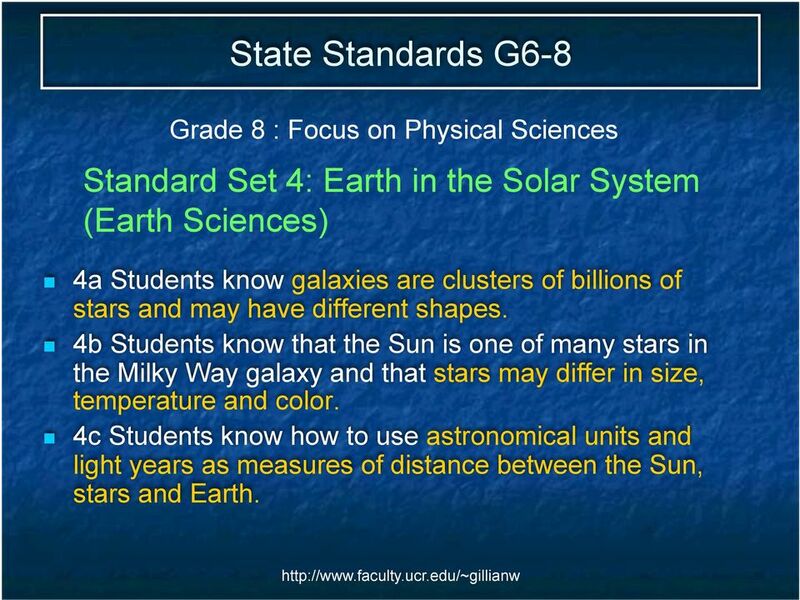 12 State Standards G6-8 Grade 8 : Focus on Physical Sciences Standard Set 4: Earth in the Solar System (Earth Sciences) 4a Students know galaxies are clusters of billions of stars and may have different shapes. 4b Students know that the Sun is one of many stars in the Milky Way galaxy and that stars may differ in size, temperature and color. 4c Students know how to use astronomical units and light years as measures of distance between the Sun, stars and Earth. 15 Einstein & The General Theory of Relativity Einstein s equations said that the Universe should be either expanding or collapsing. He assumed that the Universe was static. 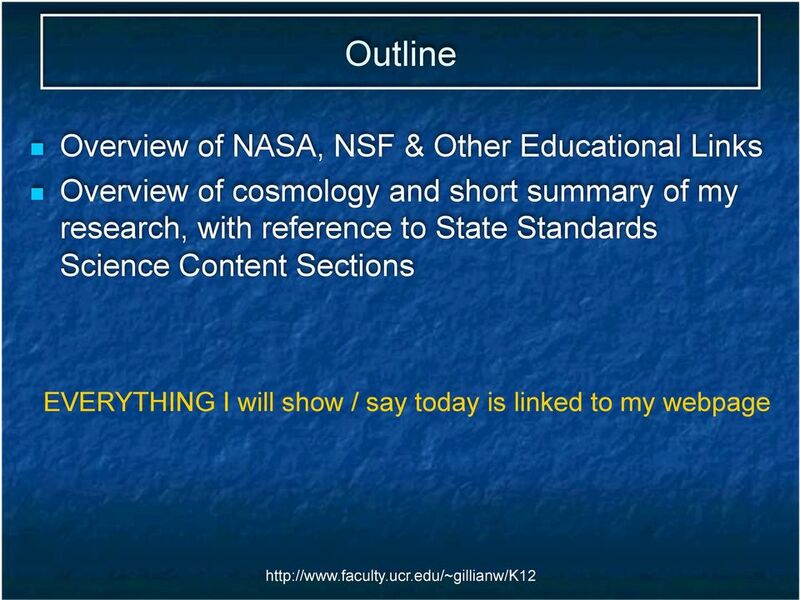 His fix - Add a constant term, the cosmological constant to cancel the effects of gravity on very large scales. Einstein won the Nobel Prize in but not for Relativity. 18 Galaxy Distances and Radial Velocities Hubble measured the distances to 24 nearby galaxies. 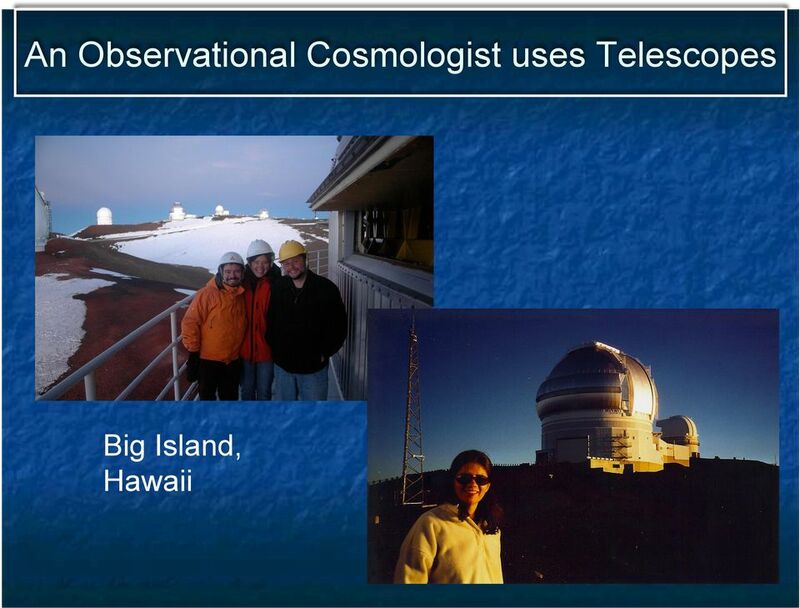 He also measured the spectra of these galaxies. 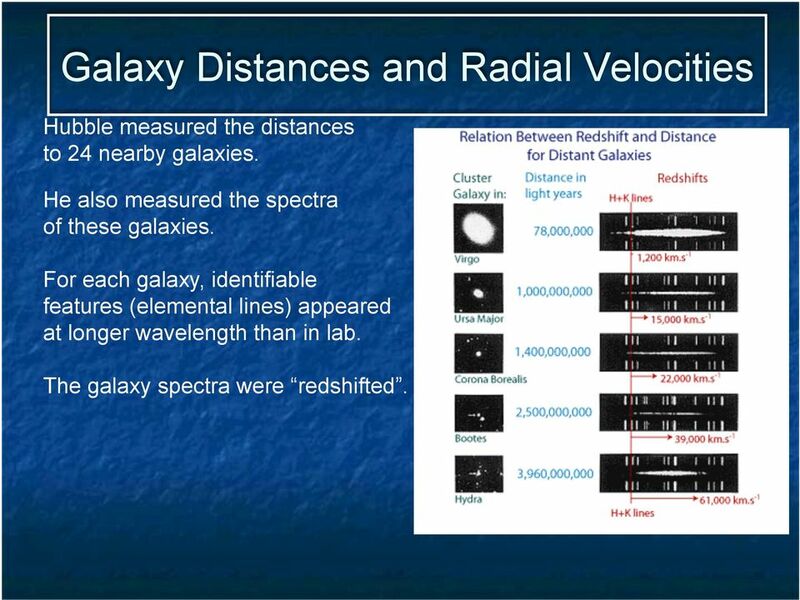 For each galaxy, identifiable features (elemental lines) appeared at longer wavelength than in lab. The galaxy spectra were redshifted. 20 Galaxy Distances and Radial Velocities Hubble measured the distances to 24 nearby galaxies. 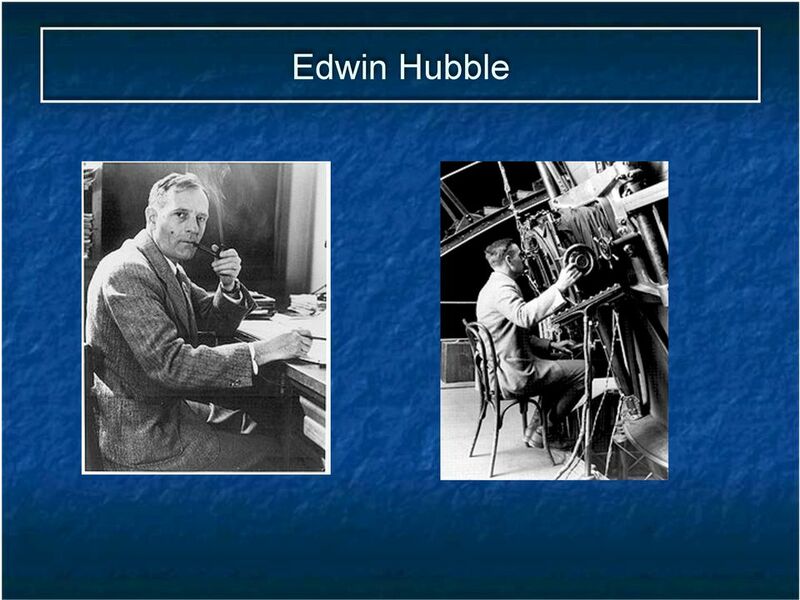 He also measured the spectra of these galaxies. 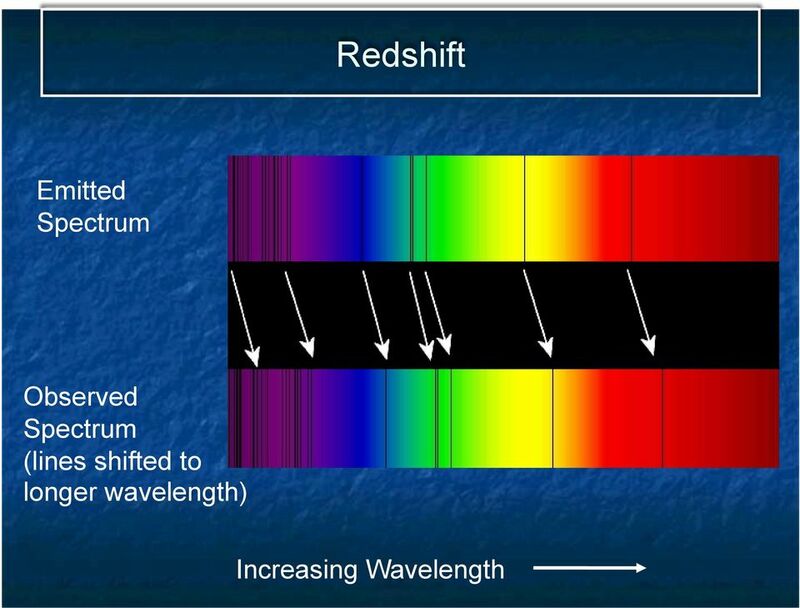 For each galaxy, identifiable features (elemental lines) appeared at longer wavelength than in lab. The galaxy spectra were redshifted. Interpretation : Most galaxies moving away from our galaxy The velocity was proportional to the distance to the galaxy. 21 The Universe is Expanding!! 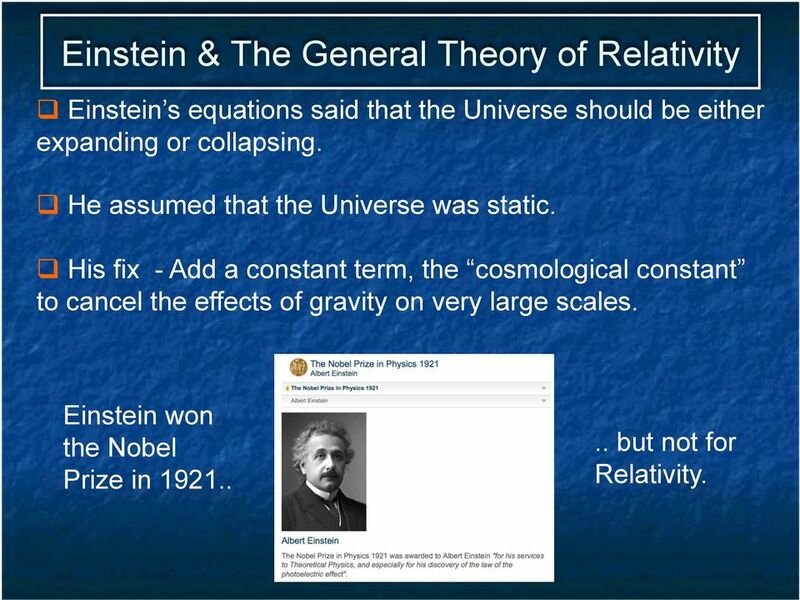 22 Einstein & The General Theory of Relativity Einstein s equations said that the Universe should be either expanding or collapsing. He assumed that the Universe was static. 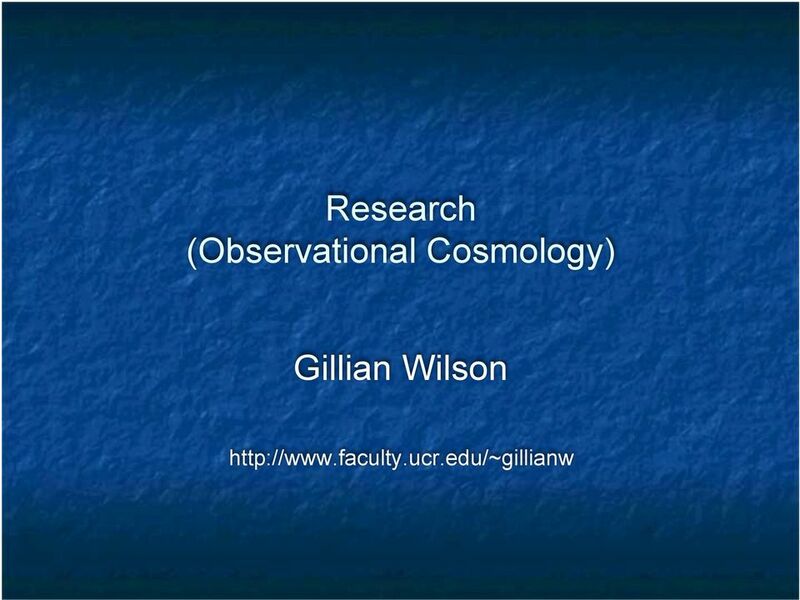 His fix - Add a constant term, the cosmological constant to cancel the effects of gravity on very large scales. After Hubble discovered that the Universe was expanding, Einstein realized he had missed the opportunity to predict the expansion of the Universe. 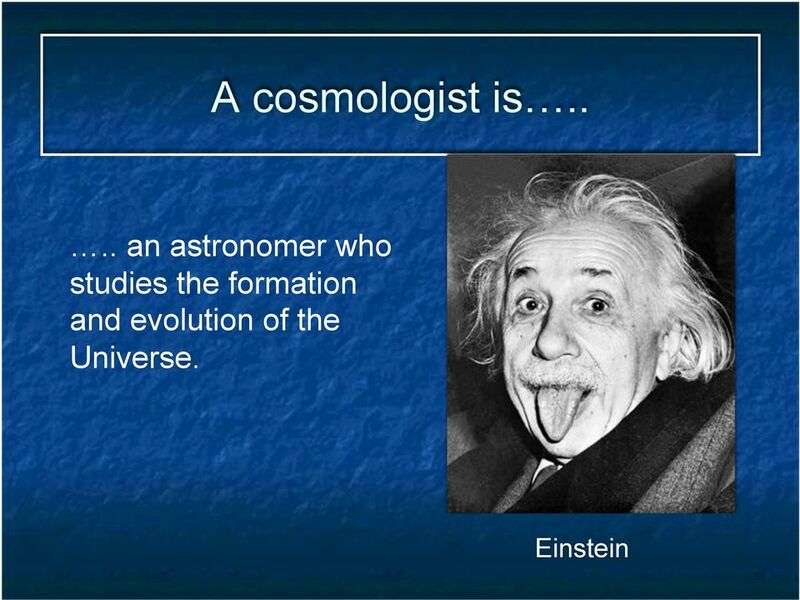 He called the cosmological constant his "greatest blunder." 27 We know how the Universe began.. but we are not sure how it will end Will it recollapse in a Big Crunch? Or will it continue to expand forever resulting in a Big Freeze? 29 What is a Cluster of Galaxies? Exactly what it sounds like! Galaxies sometimes collect together, they cluster The Universe is expanding and most galaxies are moving away from each other but there are some rare regions where hundreds or even thousands of galaxies are gravitationally bound together. The galaxies in these regions will stay close together for all time. 30 The Coma Cluster The Coma cluster is named after the constellation in which it is found, Coma Berenices. Coma means hair in Latin. This is the nearest example of a rich (many galaxies) cluster. It is at a distance of 120,000,000 light years. 33 Gravitational Lensing Hubble Space Telescope Image of A1689 Dark matter needed to lens galaxies behind cluster into spectacular giant arcs. 34 Nature of Dark Matter? 35 Dark Matter Candidates MACHOS (MAssive Compact Halo ObjectS) Planets Faint stars Black holes Things we know exist But we don t think there are enough of. WIMPS (Weakly Interacting Massive Particles) Barely interact with normal matter. Hard to detect. Theorists have proposed hundreds of different particles CERN LHC (Large Hadron Collider),Switzerland Direct Searches Underground (to avoid cosmic rays) OR The Theory of Gravity could be Wrong on Large Scales?? 39 Type Ia SNe The white dwarf starts to steal mass from the larger star. When the white dwarf reaches a certain mass -- about 1.4 times the mass of our Sun -- the white dwarf becomes unstable, collapses, and then explodes! 40 SNe fainter than expected Fainter Best fit to data Brighter Fainter Brighter Distance Intrinsic luminosity known. Appear fainter than expected. => Must be further away than expected. => Distances larger than expected. 41 The Universe is Accelerating!! The rate of expansion of the Universe is speeding up with time. 46 At some time in the past, the Universe should have stopped Decelerating and begun Accelerating Can we find evidence for this? 50 Nature of Dark Energy? Smoothly distributed through space (Does not clump together under influence of gravity). May not be constant. Some theories propose dark energy evolves with time growing stronger Big Rip or even reversing sign Big Crunch. 51 Fate of the Universe? We will assume dark energy is constant. 52 Measurement of CMB Anisotropies Fossilized imprint of the infant Universe, years after the Big Bang. Red and blue show warmer and cooler patches (more or less dense regions) that correspond to the seeds from which galaxies and clusters grow. 54 A Way to Determine the Curvature of the Universe : Bending of Light Rays from CMB hot spots If the universe is closed, light rays from opposite sides of a hot spot bend toward each other If the universe is flat, light rays from opposite sides of a hot spot do not bend at all If the universe is open, light rays from opposite sides of a hot spot bend away from each other and as a result, the hot spot appears to us to be larger than it actually is. and so the hot spot appears to us with its true size. and as a result, the hot spot appears to us to be smaller than it actually is. 59 Fate of the Universe Red Line Galaxies will move further and further apart. They will gradually run out of gas to form new stars. The existing stars will start to run out of fuel and die. 60 The Fate of the Universe Not all cosmologists believe this result though. Much more research is needed. 65 A massive SpARCS cluster observed with Spitzer Space Telescope when Universe was only 4.8 billion years old This cluster image is blurrier than Hubble Space Telescope image. Foreground stars in Milky Way Galaxy These red galaxies make up the cluster. We can tell from their velocities (Doppler shift) that they are gravitationally bound. M = (9.4 ± 6.2) M Sun We can also tell from their red colors that galaxies in this cluster are already very old. 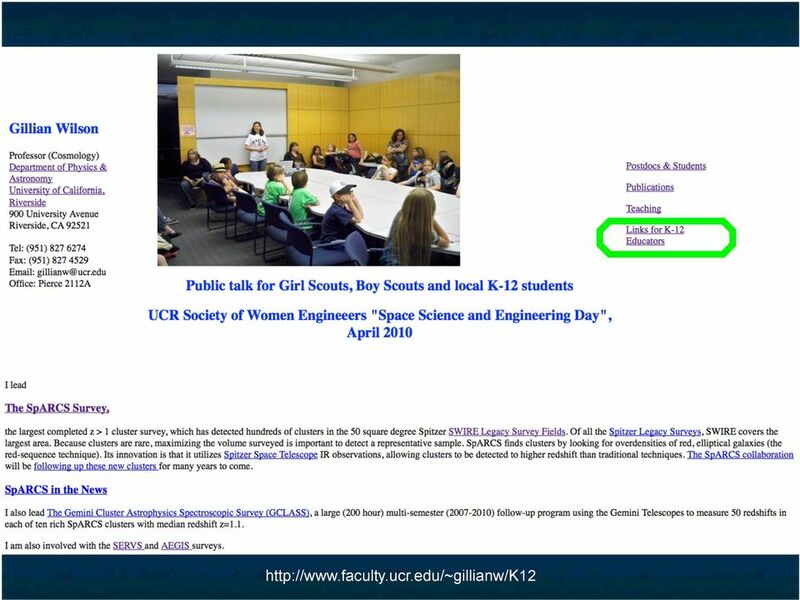 66 I lead the largest survey in the world designed to find young, distant clusters I started the survey SpARCS in My team now numbers 25 people based all around the world. We have found 200 new very distant clusters. 68 The SpARCS Survey largest every survey of very distant (< 6 billion years old) Clusters of Galaxies 200 new cluster candidates! 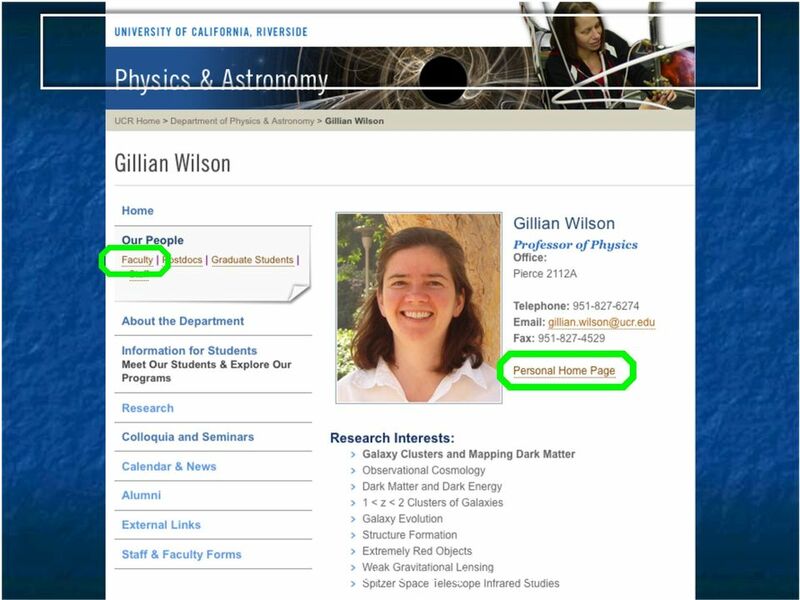 These will be used to study galaxy evolution. 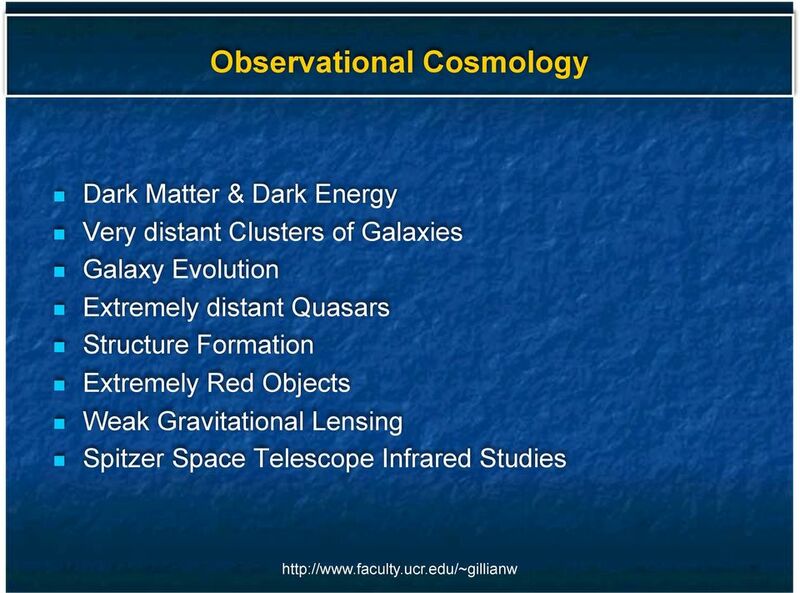 They will also be used measure the amount of dark matter & dark energy in the universe (by counting number of clusters as a function of mass at each epoch). 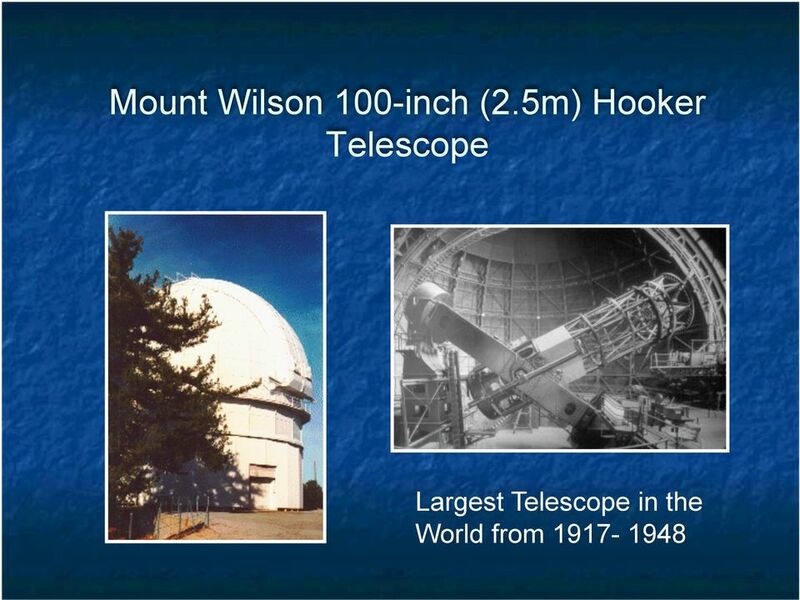 The Location of the Missing Dark Matter A.G. Kelly.